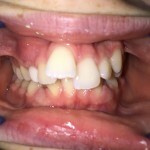 Crowded teeth – What may be Causing it? Let us try to understand this phenomenon of crowded teeth. Many people attribute genetics as a major source of crowded and misaligned teeth. Indeed, genetics has a role, although the full effects of it is sometimes hard to prove. One other major factor to consider is environmental. There are various environmental factors which can contribute but most of them converges onto a central topic: the inability to breathe through the nose causing mouth-breathing during childhood. These environmental factors include air pollution (either industrial or pollen), frequent respiratory infections and dietary constituents which can inflame the airway. Diet, for example, is a huge contributor to mouth-breathing, especially in kids. Certain food such as refined sugar and gluten can inflame the inner lining of the nose. As airflow through the nose becomes more difficult, the body adapts via mouth-breathing to increase the amount of air drawn in. The muscles around the mouth region would continuously constrict with mouth-breathing, thus exerting a force onto the teeth – pushing it inwards. This triggers an endless spiral as mouth-breathing narrows both the upper and lower jaw. A narrowed upper jaw means a narrower floor of the nose and a narrow lower jaw pushes the tongue slightly backwards to accommodate it – both of this combined will restrict the opening of the airway. We come to a full circle, as a restricted nose and airway makes it more difficult to breathe through the nose and causes a person to breathe more through the mouth again. This can manifest itself as crowded teeth in the mouth. The holistic point of view extends beyond straighter teeth: if the underlying cause, which in most cases is the inability to breathe through the nose is not rectified, the crowding will return again. Have you heard of friends who’ve worn braces before, only to complain years after that the crowding of teeth is coming back?